I recently came across some strange x-rays of a hand. At first, I thought the deformation of the bone and hand tissue was perhaps due to an accident of some sort, but the longer I looked at the x-ray, the less sense that made to me. After some research, I learned that what I was looking at was a product of Plummer-Vinson Syndrome. microcytic hypochromic anemia – this is when your body has less red blood cells than normal, and they are too small. Many times, this is caused by an iron deficiency. oesophageal strictures: this is a narrowing of the esophagus, which is the tube from the mouth to the stomach. This can cause issues swallowing. I can understand how the three above symptoms go together, but that still doesn’t explain what is going on in that hand. This is the syndrome when associated with associated with Mutilans Rheumatoid Arthritis. This doesn’t happen to everyone who is diagnosed with Plummer-Vinson Syndrome, but for those who do experience this type of bone pathology, iron deficiency is believed to be a very important contributing factor. Other factors are said to include genetics and other autoimmune operations. So, what exactly are we looking at here? With Mutilans Rheumatoid Arthritis, the person’s fingers are shortened because of arthritis. In this case the shortening became so drastic that the hand looks more like a paw. 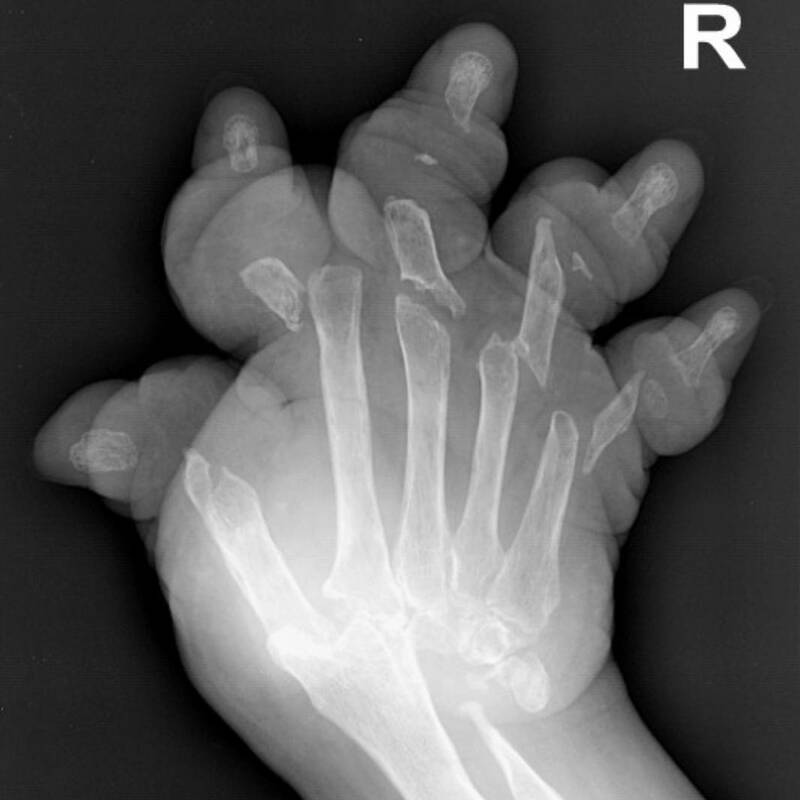 The first deformity occurring at the interphalangeal and metacarpophalangeal joints. The excess skin caused by the deformities of the finger bones folds around itself. As the condition progresses, the bones absorb and skeletal architecture is lost.